BEIRUT (Reuters) - A number of protests have broken out in Iran since the beginning of the year over water, a growing political concern due to a drought which residents of parched areas and analysts say has been exacerbated by mismanagement. The demonstrations have been relatively small, sporadic and limited to towns around the central city of Isfahan and Khuzestan province in the west. But they have highlighted an issue that played a role in earlier unrest and the authorities have cracked down, while recognising the need for change. In early March, the turnout was light in a town near Isfahan, with dozens of farmers chanting the tongue-in-cheek slogan "Death to farmers, long live oppressors! ", according to online videos. A week later the protests became more tense. Dozens of riot police on motorcycles faced off against farmers in the same town, Varzaneh, another video showed. Smoke swirled around the protesters and the person filming said tear gas was being fired. A second person reported clashes. Police in the city of Isfahan were not immediately available to comment. “What’s called drought is more often the mismanagement of water,” said a journalist in Varzaneh, who asked not to be identified because of the sensitivity of the subject. Farmers accuse local politicians of allowing water to be diverted from their areas in return for bribes. While the nationwide protests in December and January stemmed from anger over high prices and alleged corruption, in rural areas, lack of access to water was also a major cause, analysts say. At least 25 people were killed and, according to one parliamentarian, up to 3,700 people were arrested, the biggest challenge yet for the government of president Hassan Rouhani, who was reelected last year. In Syria, drought was one of the causes of anti-government protests which broke out in 2011 and led to civil war, making the Iranian drought particularly sensitive. 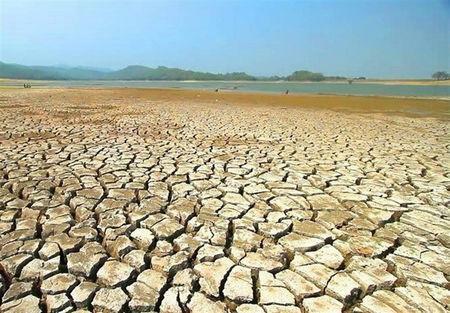 Approximately 97 percent of the country is experiencing drought to some degree, according to the Islamic Republic of Iran Meteorological Organization. Rights groups say it has driven many people from their homes. “Towns and villages around Isfahan have been hit so hard by drought and water diversion that they have emptied out and people who lived there have moved,” said Hadi Ghaemi, the executive director for the Center for Human Rights in Iran (CHRI), a New York-based advocacy group. Rouhani and Iran's Supreme Leader Ayatollah Ali Khamenei mentioned drought as a problem that needs to be addressed in the country during their speech last week commemorating Nowruz, the Iranian new year, while condemning "lawlessness and violence". An ad running on state TV which encourages Iranian citizens to conserve water shows a man sitting in a chair in the middle of a desert with the slogan, "Drought is closer than you think". A United Nations report last year noted, "Water shortages are acute; agricultural livelihoods no longer sufficient. With few other options, many people have left, choosing uncertain futures as migrants in search of work." In early January, protests in the town of Qahderijan, some 10 km (6 miles) west of Isfahan, quickly turned violent as security forces opened fire on crowds, killing at least five people, according to activists. One of the dead was a farmer, CHRI said, and locals said water rights were the main grievance. Videos posted on social media show protesters chanting outside a police station and throwing Molotov cocktails at the building, one of the most violent incidents documented during the nationwide protests. A journalist in Qahderijan who asked not to be identified because of the sensitivity of the issue said the attack on the police station was not the right thing to do but that water mismanagement had deprived farmers of their livelihoods. Hassan Kamran, a parliamentarian from Isfahan, publicly criticised energy minister Reza Ardakanian this month, accusing him of not properly implementing a water distribution law. "The security and intelligence forces shouldn’t investigate our farmers. The water rights are theirs," he told a parliamentary session. In early March, Ardakanian set up a working group comprising four ministers and two presidential deputies to deal with the crisis. Since the January protests, Rouhani has repeatedly said the government will do what it can to address grievances. But there is no quick fix for deeply rooted environmental issues like drought, observers say. “These are local grievances but the solutions are with the national government,” said Tara Sepehri Far, Iran researcher for Human Rights Watch, adding that the government had limited power and widespread corruption. Rouhani's office was not immediately available to comment. Iranian security forces are aware of the potential for water issues to cause instability. A senior Revolutionary Guards commander, Yahya Rahim Safavi, noted in a public speech in late February that water will play a key role for both the Islamic Republic’s national and regional security. Environmentalists have found themselves in the firing line. In late January, Kavous Seyed-Emami, the director of the Persian Wildlife Heritage Foundation, and six other environmentalists were arrested. Two weeks later, authorities said Seyed-Emami had committed suicide in jail after confessing to being a spy for the United States and Israel. His family has denied the allegation. State TV later aired a report saying Seyed-Emami and his colleagues were telling Iran's enemies the country could no longer maintain domestic agriculture production because of a water shortage and needed to import food. In late February, three more environmentalists were arrested and three weeks ago, Seyed-Emami’s wife was prevented from leaving Iran, according to family members.